Rustic and original in a good way, this vintage cabin embodies all the charm of yesteryear. The rock fireplace was built from river rocks just steps away from the deck. The cabin on the left is a separate bunkhouse with its own bathroom which is nice for the grandparents if they want some privacy or quiet time away from the kids! There are three sleeping areas, 2 bathrooms, the cabin overlooks the river, and has ample parking. 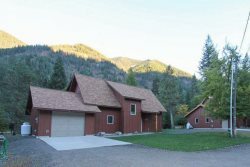 This large, old-time cabin is a great fit for your family and/or friends while vacationing at Wallowa Lake. This cabin is also within walking distance to many Wallowa Lake activities including hiking, go carts, restaurants, and more! There is a big deck that looks out over the river which is nice for barbecues on summer evenings! Bring your friends and family to this historic cabin and have fun in this beautiful place called Wallowa County! 11 sets of towels if you need more you are welcome to bring more.